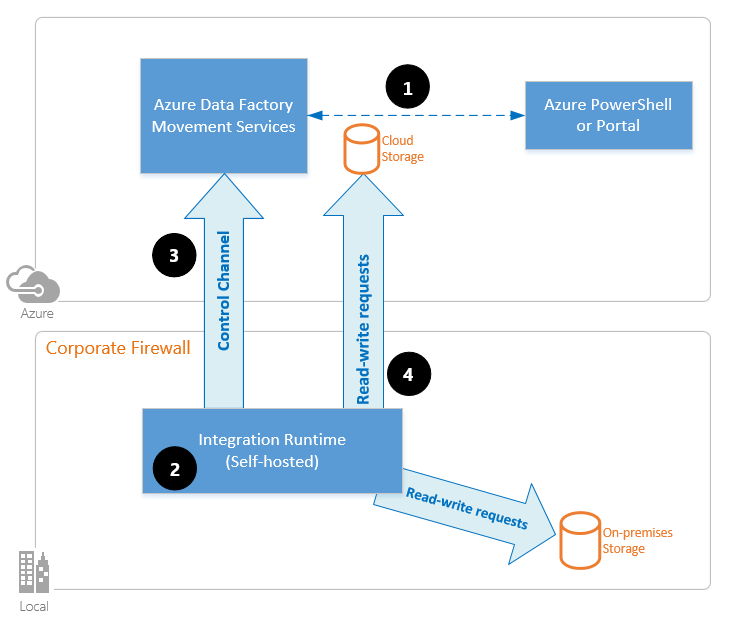 The integration runtime (IR) is the compute infrastructure that Azure Data Factory uses to provide data-integration capabilities across different network environments. For details about IR, see Integration runtime overview. A self-hosted integration runtime can run copy activities between a cloud data store and a data store in a private network, and it can dispatch transform activities against compute resources in an on-premises network or an Azure virtual network. The installation of a self-hosted integration runtime needs on an on-premises machine or a virtual machine (VM) inside a private network. This document describes how you can create and configure a self-hosted IR. Set-AzDataFactoryV2IntegrationRuntime -ResourceGroupName $resourceGroupName -DataFactoryName $dataFactoryName -Name $selfHostedIntegrationRuntimeName -Type SelfHosted -Description "selfhosted IR description"
Download and install the self-hosted integration runtime on a local machine. You can automate self-hosted IR setup on an Azure virtual machine by using this Azure Resource Manager template. This template provides an easy way to have a fully functioning self-hosted IR inside an Azure virtual network with high-availability and scalability features (as long as you set the node count to 2 or higher). When you move data between on-premises and the cloud, the activity uses a self-hosted integration runtime to transfer the data from an on-premises data source to the cloud and vice versa. The data developer creates a self-hosted integration runtime within an Azure data factory by using a PowerShell cmdlet. Currently, the Azure portal does not support this feature. The data developer creates a linked service for an on-premises data store by specifying the self-hosted integration runtime instance that it should use to connect to data stores. The self-hosted integration runtime node encrypts the credentials by using Windows Data Protection Application Programming Interface (DPAPI) and saves the credentials locally. If multiple nodes are set for high availability, the credentials are further synchronized across other nodes. Each node encrypts the credentials by using DPAPI and stores them locally. Credential synchronization is transparent to the data developer and is handled by the self-hosted IR. The Data Factory service communicates with the self-hosted integration runtime for scheduling and management of jobs via a control channel that uses a shared Azure Service Bus queue. When an activity job needs to be run, Data Factory queues the request along with any credential information (in case credentials are not already stored on the self-hosted integration runtime). The self-hosted integration runtime kicks off the job after polling the queue. The self-hosted integration runtime copies data from an on-premises store to a cloud storage, or vice versa depending on how the copy activity is configured in the data pipeline. For this step, the self-hosted integration runtime directly communicates with cloud-based storage services such as Azure Blob storage over a secure (HTTPS) channel. A single self-hosted integration runtime can be used for multiple on-premises data sources. A single self-hosted integration runtime can be shared with another data factory within the same Azure Active Directory tenant. For more information, see Sharing a self-hosted integration runtime. You can have only one instance of a self-hosted integration runtime installed on a single machine. If you have two data factories that need to access on-premises data sources, you need to install the self-hosted integration runtime on two on-premises computers each from both the data factories or use the self-hosted IR sharing feature to share a self-hosted integration runtime with another Data Factory. The self-hosted integration runtime does not need to be on the same machine as the data source. However, having the self-hosted integration runtime closer to the data source reduces the time for the self-hosted integration runtime to connect to the data source. We recommend that you install the self-hosted integration runtime on a machine that is different from the one that hosts on-premises data source. When the self-hosted integration runtime and data source are on different machines, the self-hosted integration runtime does not compete for resources with the data source. You can have multiple self-hosted integration runtimes on different machines that connect to the same on-premises data source. For example, you might have two self-hosted integration runtimes that serve two data factories, but the same on-premises data source is registered with both the data factories. 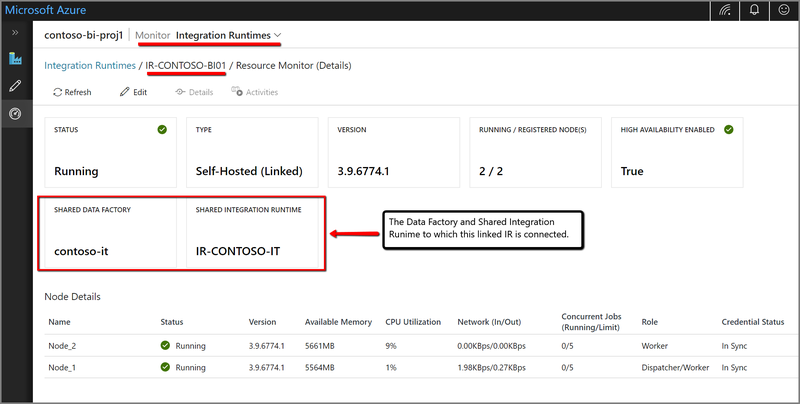 If you already have a gateway installed on your computer to serve a Power BI scenario, install a separate self-hosted integration runtime for Azure Data Factory on another machine. The self-hosted integration runtime must be used for supporting data integration within an Azure virtual network. Treat your data source as an on-premises data source that is behind a firewall, even when you use Azure ExpressRoute. Use the self-hosted integration runtime to establish connectivity between the service and the data source. 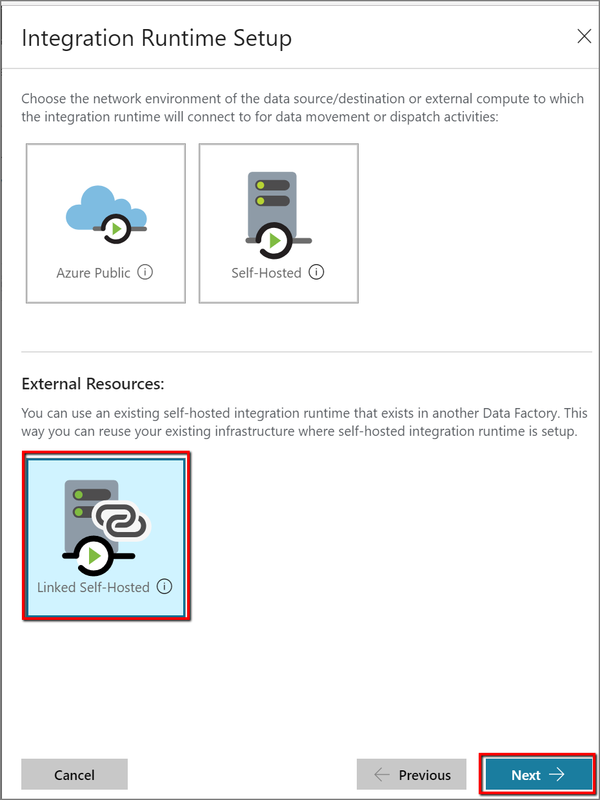 You must use the self-hosted integration runtime even if the data store is in the cloud on an Azure IaaS virtual machine. Tasks might fail in a self-hosted integration runtime that's installed on a Windows server on which FIPS-compliant encryption is enabled. To work around this problem, disable FIPS-compliant encryption on the server. To disable FIPS-compliant encryption, change the following registry value from 1 (enabled) to 0 (disabled): HKLM\System\CurrentControlSet\Control\Lsa\FIPSAlgorithmPolicy\Enabled. The supported operating system versions are Windows 7 Service Pack 1, Windows 8.1, Windows 10, Windows Server 2008 R2 SP1, Windows Server 2012, Windows Server 2012 R2, and Windows Server 2016. Installation of the self-hosted integration runtime on a domain controller is not supported. .NET Framework 4.6.1 or later is required. If you're installing the self-hosted integration runtime on a Windows 7 machine, install .NET Framework 4.6.1 or later. See .NET Framework System Requirements for details. The recommended configuration for the self-hosted integration runtime machine is at least 2 GHz, four cores, 8 GB of RAM, and an 80-GB disk. If the host machine hibernates, the self-hosted integration runtime does not respond to data requests. Configure an appropriate power plan on the computer before you install the self-hosted integration runtime. If the machine is configured to hibernate, the self-hosted integration runtime installation prompts a message. You must be an administrator on the machine to install and configure the self-hosted integration runtime successfully. Copy activity runs happen on a specific frequency. Resource usage (CPU, memory) on the machine follows the same pattern with peak and idle times. Resource utilization also depends heavily on the amount of data being moved. When multiple copy jobs are in progress, you see resource usage go up during peak times. You can install the self-hosted integration runtime by downloading an MSI setup package from the Microsoft Download Center. See Move data between on-premises and cloud article for step-by-step instructions. Configure a power plan on the host machine for the self-hosted integration runtime so that the machine does not hibernate. If the host machine hibernates, the self-hosted integration runtime goes offline. Back up the credentials associated with the self-hosted integration runtime regularly. Go to the Microsoft integration runtime download page. Select Download, select the 64-bit version (32-bit is not supported), and select Next. Run the MSI file directly, or save it to your hard disk and run it. On the Welcome page, select a language and select Next. Accept the Microsoft Software License Terms and select Next. Select folder to install the self-hosted integration runtime, and select Next. On the Ready to install page, select Install. a. Paste the authentication key in the text area. b. Optionally, select Show authentication key to see the key text. Higher availability of the self-hosted integration runtime so that it's no longer the single point of failure in your big data	solution or cloud data integration with Azure Data Factory, ensuring continuity with up to four nodes. You can associate multiple nodes by installing the self-hosted integration runtime software from the Download Center. Then, register it by using either of the authentication keys obtained from the New-AzDataFactoryV2IntegrationRuntimeKey cmdlet, as described in the tutorial. You don't need to create new self-hosted integration runtime for associating each node. You can install the self-hosted integration runtime on another machine and register it by using the same authentication key. Before you add another node for high availability and scalability, ensure that the Remote access to intranet option is enabled on the first node (Microsoft Integration Runtime Configuration Manager > Settings > Remote access to intranet). When the available memory on the self-hosted IR is low and the CPU usage is high, adding a new node helps scale out the load across machines. If activities are failing because they're timing out or because the self-hosted IR node is offline, it helps if you add a node to the gateway. The certificate must be a publicly trusted X509 v3 certificate. We recommend that you use certificates that are issued by a public (partner) certification authority (CA). Each integration runtime node must trust this certificate. We don't recommend Subject Alternative Name (SAN) certificates because only the last SAN item will be used and all others will be ignored due to current limitations. For example, if you have a SAN certificate whose SANs are node1.domain.contoso.com and node2.domain.contoso.com, you can use this certificate only on a machine whose FQDN is node2.domain.contoso.com. The certificate supports any key size supported by Windows Server 2012 R2 for SSL certificates. Certificates that use CNG keys are not supported. This certificate is used to encrypt ports on self-hosted IR node, used for node-to-node communication (for state synchronization which includes linked services' credentials synchronization across nodes) and while using PowerShell cmdlet for linked service credential setting from within local network. We suggest using this certificate if your private network environment is not secure or if you would like to secure the communication between nodes within your private network as well. Data movement in transit from self-hosted IR to other data stores always happens using encrypted channel, irrespective of this certificate set or not. You can reuse an existing self-hosted integration runtime infrastructure that you already set up in a data factory. This enables you to create a linked self-hosted integration runtime in a different data factory by referencing an existing self-hosted IR (shared). 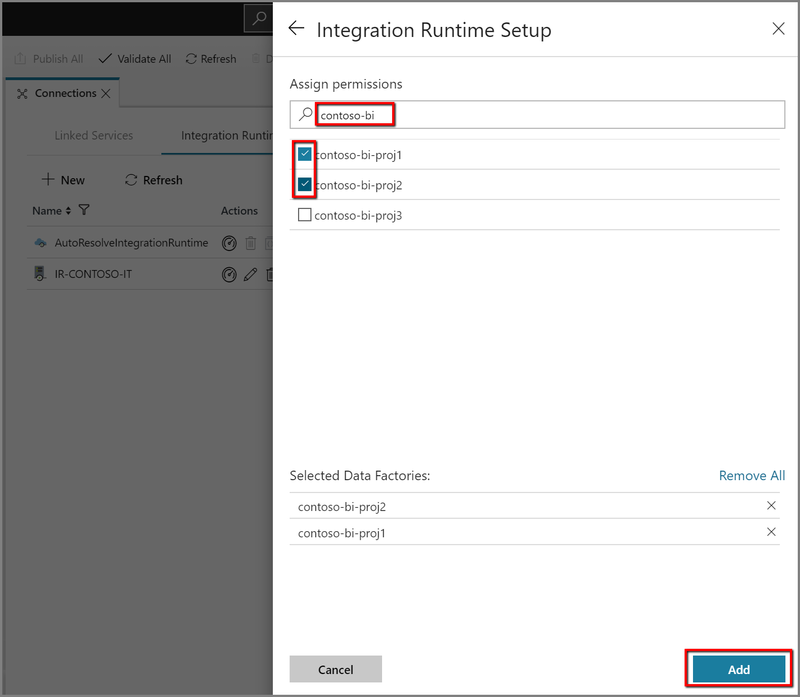 To share a self-hosted integration runtime by using PowerShell, see Create a shared self-hosted integration runtime in Azure Data Factory with PowerShell. Shared IR: The original self-hosted IR that's running on a physical infrastructure. Linked IR: The IR that references another shared IR. This is a logical IR and uses the infrastructure of another self-hosted IR (shared). In the self-hosted IR to be shared, grant permission to the data factory in which you want to create the linked IR. Note the resource ID of the self-hosted IR to be shared. In the data factory to which the permissions were granted, create a new self-hosted IR (linked) and enter the resource ID. The data factory in which a linked IR will be created must have an MSI. By default, the data factories created in the Azure portal or PowerShell cmdlets have an MSI created implicitly. 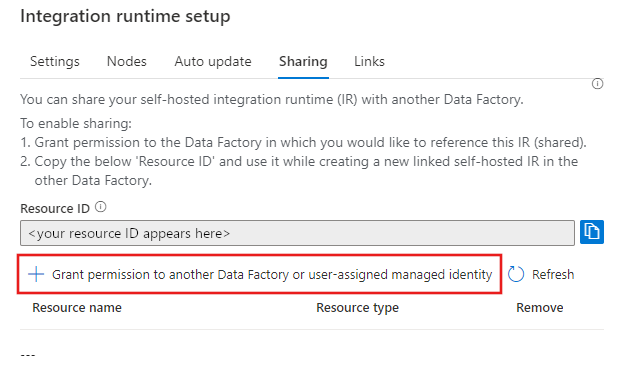 But when a data factory is created through an Azure Resource Manager template or SDK, the Identity property must be set explicitly to ensure that Azure Resource Manager creates a data factory that contains an MSI. The Azure Data Factory .NET SDK that supports this feature is version 1.1.0 or later. To grant permission, the user needs the Owner role or the inherited Owner role in the data factory where the shared IR exists. Sharing feature works only for Data Factories within the same Azure Active Directory tenant. For Active Directory guest users, the search functionality (listing all data factories by using a search keyword) in the UI does not work. 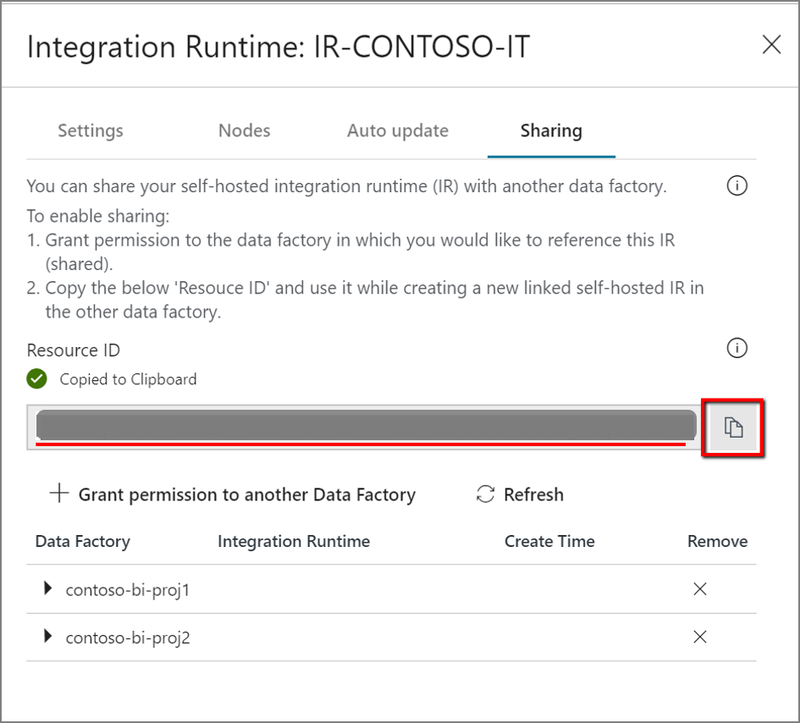 But as long as the guest user is the Owner of the data factory, they can share the IR without the search functionality, by directly typing the MSI of the data factory with which the IR needs to be shared in the Assign Permission text box and selecting Add in the Azure Data Factory UI. This feature is available only in Azure Data Factory V2. If you move your cursor over the icon or message in the notification area, you can find details about the state of the self-hosted integration runtime. There are two firewalls to consider: the corporate firewall running on the central router of the organization, and the Windows firewall configured as a daemon on the local machine where the self-hosted integration runtime is installed. At the Windows firewall level (machine level), these outbound ports are normally enabled. If not, you can configure the domains and ports accordingly on a self-hosted integration runtime machine. Based on your source and sinks, you might have to whitelist additional domains and outbound ports in your corporate firewall or Windows firewall. For some cloud databases (for example, Azure SQL Database and Azure Data Lake), you might need to whitelist IP addresses of self-hosted integration runtime machines on their firewall configuration. Ensure that the firewall rules are enabled properly on the corporate firewall, the Windows firewall on the self-hosted integration runtime machine, and the data store itself. Enabling these rules allows the self-hosted integration runtime to connect to both source and sink successfully. Enable rules for each data store that is involved in the copy operation. Allow outbound TCP communication on port 1433 for both Windows firewall and corporate firewall. 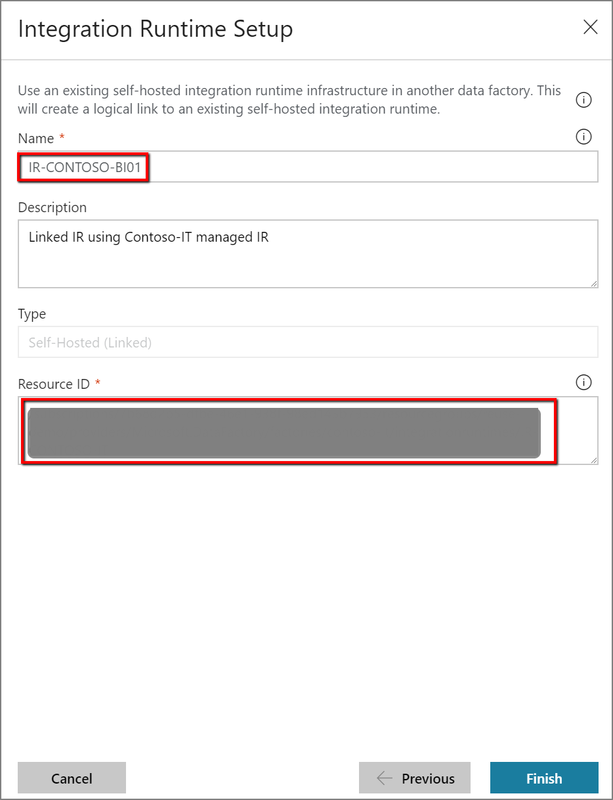 Configure the firewall settings of the Azure SQL database to add the IP address of the self-hosted integration runtime machine to the list of allowed IP addresses. If your firewall does not allow outbound port 1433, the self-hosted integration runtime can't access the Azure SQL database directly. In this case, you can use a staged copy to Azure SQL Database and Azure SQL Data Warehouse. In this scenario, you would require only HTTPS (port 443) for the data movement. 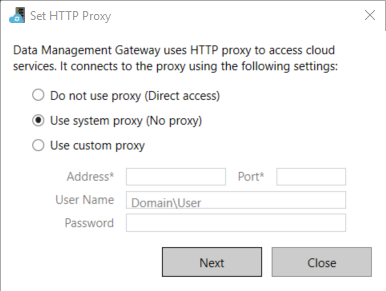 If your corporate network environment uses a proxy server to access the internet, configure the self-hosted integration runtime to use appropriate proxy settings. You can set the proxy during the initial registration phase. When configured, the self-hosted integration runtime uses the proxy server to connect to the cloud service, source/ destination (those using HTTP/ HTTPS protocol). This is Select Change link during initial setup. You see the proxy-setting dialog box. Do not use proxy: The self-hosted integration runtime does not explicitly use any proxy to connect to cloud services. Use system proxy: The self-hosted integration runtime uses the proxy setting that is configured in diahost.exe.config and diawp.exe.config. 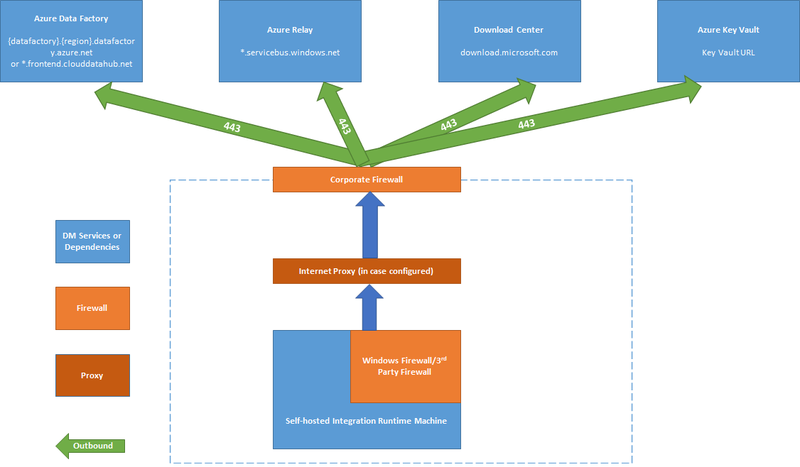 If no proxy is configured in diahost.exe.config and diawp.exe.config, the self-hosted integration runtime connects to the cloud service directly without going through a proxy. 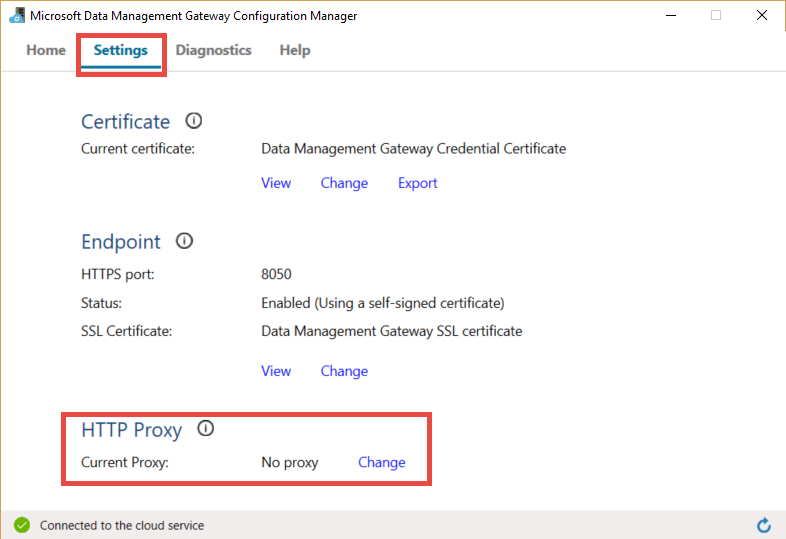 Use custom proxy: Configure the HTTP proxy setting to use for the self-hosted integration runtime, instead of using configurations in diahost.exe.config and diawp.exe.config. Address and Port are required. User Name and Password are optional depending on your proxy’s authentication setting. All settings are encrypted with Windows DPAPI on the self-hosted integration runtime and stored locally on the machine. The integration runtime Host Service restarts automatically after you save the updated proxy settings. After the self-hosted integration runtime has been successfully registered, if you want to view or update proxy settings, use Integration Runtime Configuration Manager. Open Microsoft Integration Runtime Configuration Manager. Select the Change link in the HTTP Proxy section to open the Set HTTP Proxy dialog box. Select Next. You then see a warning that asks for your permission to save the proxy setting and restart the integration runtime Host Service. 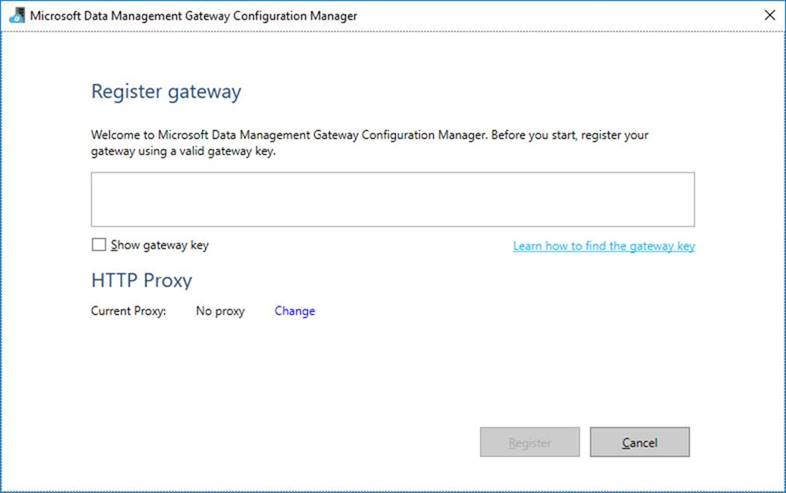 You can view and update the HTTP proxy by using the Configuration Manager tool. If you set up a proxy server with NTLM authentication, the integration runtime Host Service runs under the domain account. If you change the password for the domain account later, remember to update the configuration settings for the service and restart it accordingly. Due to this requirement, we suggest that you use a dedicated domain account to access the proxy server that does not require you to update the password frequently. In File Explorer, make a safe copy of C:\Program Files\Microsoft Integration Runtime\3.0\Shared\diahost.exe.config to back up the original file. Additional properties are allowed inside the proxy tag to specify the required settings like scriptLocation. See proxy Element (Network Settings) for syntax. Save the configuration file in the original location. Then restart the self-hosted integration runtime Host Service, which picks up the changes. To restart the service, use the services applet from the control panel. Or from Integration Runtime Configuration Manager, select the Stop Service button, and then select Start Service. If the service does not start, it's likely that an incorrect XML tag syntax was added in the application configuration file that was edited. Don't forget to update both diahost.exe.config and diawp.exe.config. You also need to make sure that Microsoft Azure is in your company’s whitelist. You can download the list of valid Microsoft Azure IP addresses from the Microsoft Download Center. If you encounter errors similar to the following ones, it's likely due to improper configuration of the firewall or proxy server, which blocks the self-hosted integration runtime from connecting to Data Factory to authenticate itself. To ensure that your firewall and proxy server are properly configured, refer to the previous section. When you try to register the self-hosted integration runtime, you receive the following error: "Failed to register this Integration Runtime node! Confirm that the Authentication key is valid and the integration service Host Service is running on this machine." A component of Integration Runtime has become unresponsive and restarts automatically. Component name: Integration Runtime (Self-hosted). If you use PowerShell to encrypt credentials from another machine (in the network) other than where the self-hosted integration runtime is installed, you can enable the Remote Access from Intranet option. If you run PowerShell to encrypt credentials on the same machine where the self-hosted integration runtime is installed, you can't enable Remote Access from Intranet. You should enable Remote Access from Intranet before you add another node for high availability and scalability. During self-hosted integration runtime setup (version 3.3.xxxx.x later), by default, the self-hosted integration runtime installation disables Remote Access from Intranet on the self-hosted integration runtime machine. If you choose not to open port 8060 on the self-hosted integration runtime machine, use mechanisms other than the Setting Credentials application to configure data store credentials. For example, you can use the New-AzDataFactoryV2LinkedServiceEncryptCredential PowerShell cmdlet. See the following tutorial for step-by-step instructions: Tutorial: Copy on-premises data to cloud.